I’m proud to not only hold a Life Time membership in the Coastal Conservation Association of Florida (http://www.ccaflorida.org/), but also serve as their Offshore Spokesperson. As a native South Floridian, I’ve seen the grave impact from the mismanagement of our marine resources – particularly gill nets, which nearly decimated our mackerel, redfish and sea trout stocks, to name just a few species. The Coastal Conservation Association of Florida (CCA FL) fought against this indiscriminate and destructive fishing practice, and put a ballot in front of Florida voters to ban gill nets in our waters. It won by over 72-percent of the vote. 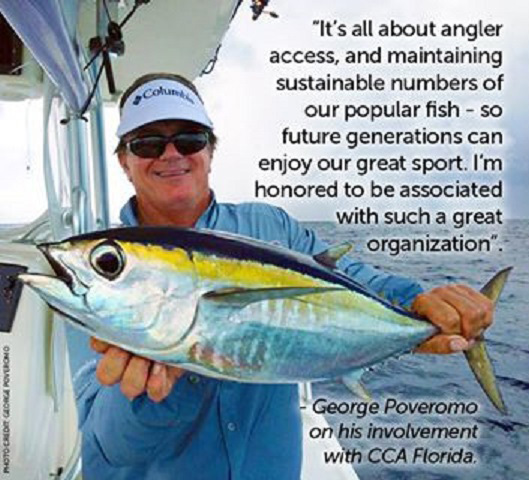 A few short years later, we saw a big rebound of our fisheries; and today, Florida has some of the most remarkable fishing it has ever seen, thanks to the efforts of the CCA FL, along with sensible bag and size limits and even partial closed seasons. It should be noted that the CCA FL is not just an “inshore” organization. In fact, over 60-percent of their current focus is on nearshore and offshore species. They are fighting for the rights of recreational anglers to fish, and against arbitrary no fishing zones. They are also against unnecessary closures on species based on outdated science (red snapper, being a prime example). If you live in Florida, please support the CCA FL (http://www.ccaflorida.org/). For non-Floridians, the CCA (http://www.joincca.org/about) has more than 206 chapters throughout 17 states with a combined membership of over 100,000. They have the backs of recreational anglers. Get behind them and help protect our precious marine resources, and our right to fish.